DESCRIPTION: Omega vintage ‘Pre-Moon’ Speedmaster Chronograph, nicely aged patina, great condition. 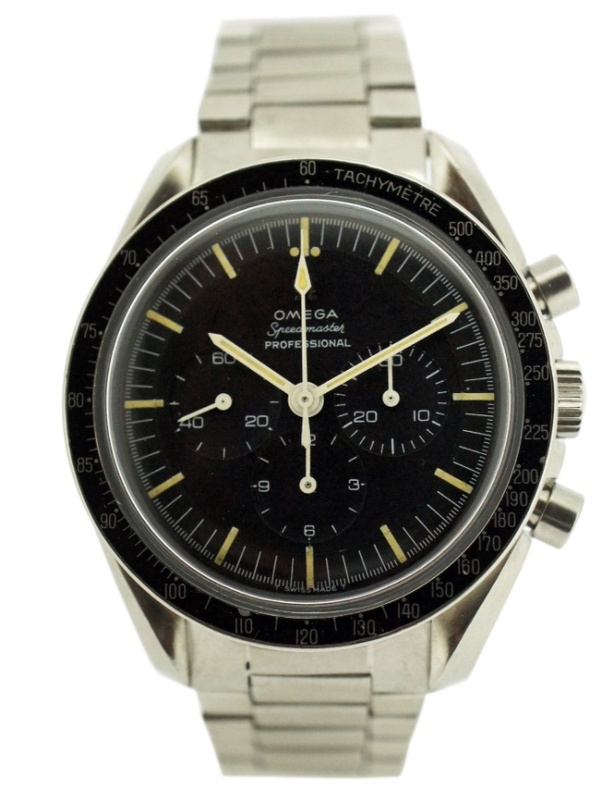 Rare 1965 early professional pre-moon Speedmaster. NOTES: The highly collectible Omega chronograph Calibre 321 was first introduced in 1942 and was a collaborative project between Omega and Lemania, one of Omega's subsidiaries at the time, who supplied it as an ebauche (Lemania cal. 2310). The Calibre 321 is recognised as one of the best example of lateral clutch, column wheel controlled chronograph and Breguet, Patek Philippe and Vacheron Constantin sourced it as a base movement for a variety of chronographs. In 1946, the movement was further improved by developing its anti-magnetic shield and shock absorption, which would both allow it to become the champion during the NASA testing for the Apollo 11 mission. Curiously, Omega only learned about the Speedmaster’s journey into space after seeing a photograph of Ed White taken during America’s first spacewalk as part of the Gemini 4 mission in June of 1965. The watch was attached to the arm via a long nylon strap secured with Velcro.